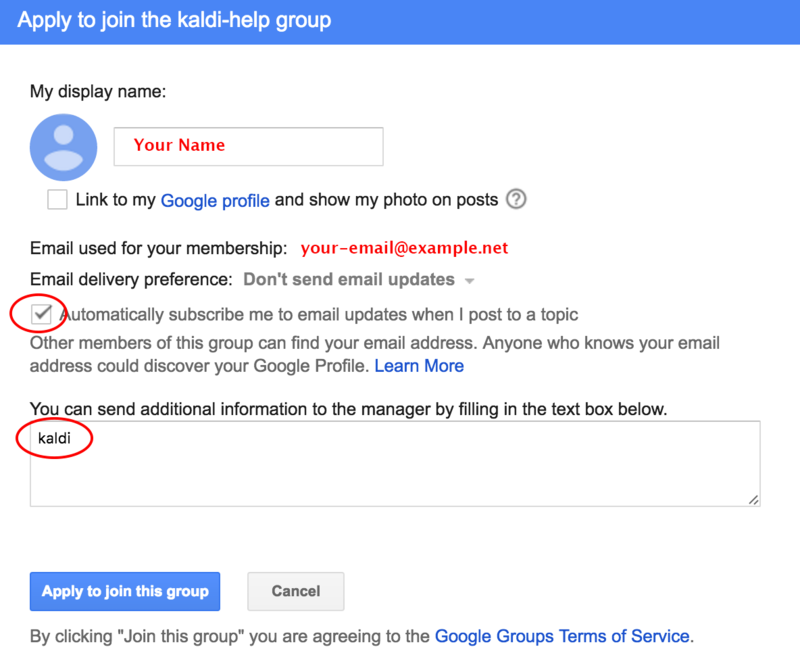 You can sign for (generally reasonably low volume) Developers list (kaldi-developers@googlegroups.com) or for a help list (kaldi-help@googlegroups.com). We generally strive to keep long discussions off-list, so the traffic in these two groups is not too huge. When subscribing, please enter something into the "Additional information" field (see the screenshot). Writing "Kaldi" there is sufficient. We will not approve your application without filling it out! This is to avoid spammers. Another way to keep updated about Kaldi development is to create a Github accout, (or sign in to an existing account), navigate to https://github.com/kaldi-asr/kaldi, and click on the 'eye' icon to 'watch' the project. This will subscribe you to notifications for pull requests and so on. Please don't create Github `issues' if you have an enquiry or just want help with something-- that's what the kaldi-help list is for. Github `issues' are for bugs, potential bugs, and feature requests. If you want to ask a question on one of the lists, please (a) try Googling it first, and (b) make it specific. Don't say "I ran the WSJ discriminative training script and it failed with an error". What exact script did you run, with what arguments? And in what directory of the Kaldi example scripts? Show us the error message along with preceding output for context. What is your operating system? What git revision of Kaldi (e.g. the output of "git log -1"). It's better to give too much information than too little. Please do not post duplicates of your question or ask the same question on a different group; if we don't respond it's usually because we are asleep or busy. Once we do reply, before asking any follow-up questions, please ensure that you have read the entire initial answer, have understood it to the best of your ability, and have tried things like web searches based on the information in the initial reply. Don't read first sentence of the reply, get stuck, and immediately ask another question-- we are busy people, and kaldi-help is not a chat session. If you are inexperienced with computers and you are asking a lot of questions because of that, we won't have much patience with you-- you should find someone local to help. If you are in mainland China and can't access Google Groups directly, please ask jtrmal@gmail.com to add you to these lists (specify kaldi-help or kaldi-developers or both).